Engineer from the Universidad de Lima with the Masters degree in Business Administration from the Universidad de Piura, majoring in Physical Distribution Logistics and International Logistics at the University of Miami / Esan. He has a long and successful managerial experience in the area of Logistics and Supply Chain, with over 30 years of professional experience in warehouse management, transportation and domestic and international distribution. 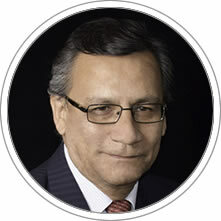 He currently serves as General Manager Logistics LINK Peru S.A., an organization that provides comprehensive international freight agency, customs agency, customs warehousing, domestic transportation and distribution to point of sale. With an extensive academic experience, since 2006, he has beens a speaker at the Universidad Nacional de Ingenieria-UNI, ESAN Business School, Peruvian Institute of Business Action (IEEP) and various industry events in the logistics sector. He is currently a professor in the academic area of Operations, Logistics and Technology Graduate Business School CENTRUM Catolica.